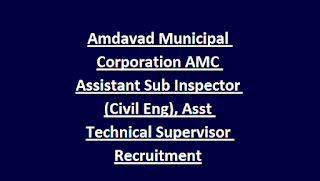 Engineering and Assistant Technical Supervisor posts in this Amdavad Municipal Corporation Recruitment 2018 Notification. Selection for Amdavad AMC recruitment is on basis of written test or interview. Interested candidates can submit their application form online through official website of http://www.ahmedabadcity.gov.in/. Last date to submit the application form online for this AMC ASI and Supervisor posts is 12-12-2018. Qualification, age limits, selection process and other details about this Amdavad Municipal Corporation Recruitment 2018 Notification is updated below. There are total 199 vacancies in this AMC recruitment 2018. Civil /ECE Engineering Degree or Diploma qualification having candidates can apply for this AMC recruitment 2018. Candidates selection will be based on written test or personal interview. 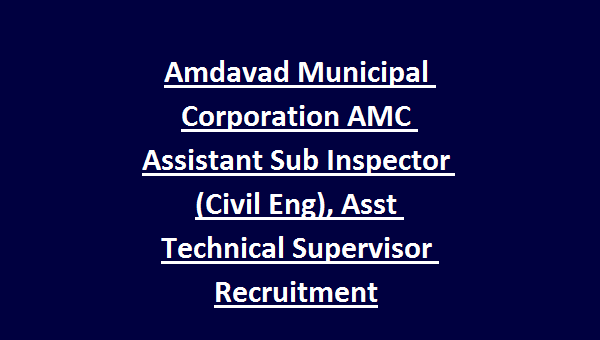 Experience having candidates will be prefered for this Amdavad Municipal Corporation Jobs.